I saw these worn in wardak by the medics. The ana like "flair" just like any other military. Mostly I saw these worn on the sleeves of the ANA digi uniforms. I have one of the ANA medic pathces as well. Seeing they are the smae size as the Infantry pocket titles, them being worn there would make sense. Somewhere I have a photo of an ANA soldier wearing THREE titles on his right pocket! nkomo wrote: I have one of the ANA medic pathces as well. Seeing they are the smae size as the Infantry pocket titles, them being worn there would make sense. Somewhere I have a photo of an ANA soldier wearing THREE titles on his right pocket! Here is a pic of my latest version of the ANA CMB. Also note the two versions that I have do not have the cresent anywhere on the badge. Also note there are gold or silver badges too. I'm curious if the cresent or the color denotes an EFMB vs CMB or the other way around? airborne1968 wrote: Here is a pic of my latest version of the ANA CMB. Also note the two versions that I have do not have the cresent anywhere on the badge. Also note there are gold or silver badges too. I'm curious if the cresent or the color denotes an EFMB vs CMB or the other way around? The ANA patch are so random, I'm sure that could be a genuine issue medic patch, but either the batch cut costs or wasn't even incorporated in the design and etc. 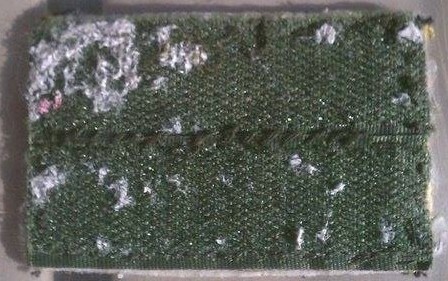 By the way, I've seen a picture of these being used, small velcro space over the left side on top of the Afg-N-Army breast tape (About the area of the Marksmanship badge), if only I could find it again. 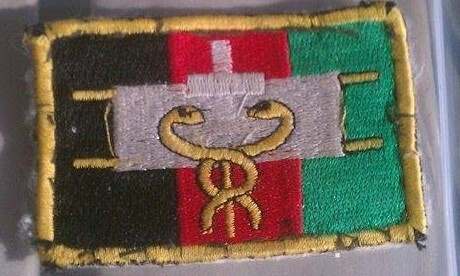 Here is an Afghan Medics Badge I just picked up.